Ernie was both an All-City and All-State basketball player while attending Tucson High School (1953-56). He was team captain and second in the city in scoring; played on the winning all-star team in Flagstaff; and was the second recipient of the annual Bud Doolen Award (1956). Ernie attended the University of Arizona where he received degrees in physical education and elementary education. While a member of the UA basketball team, he led the Wildcats in all categories (1956-57); was named Border Conference Most Valuable Player during his junior-senior year (1960); and was team co-captain his senior. 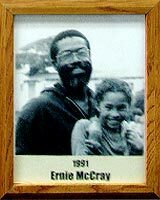 The first Afro-American basketball player to graduate from the UA, Ernie was drafted by the Cincinnati Royals of the NBA. Later relocating to San Diego, Ernie was active in city league basketball until 1983, playing on numerous all-star teams and usually leading the league in scoring and rebounding.